Another #WorkingOutLoud post today as I share the results from the 5th prototype question as i develop the Types of Trust diagnostic. This is early-stage work is intended to allow us to map out the landscape of trust that exists within the organisation, to understand the interrelationships between different parts, and to produce some kind of heat map that shows how one individual organisation compares to a baseline taken across multiple. It is not intended to give a score, but rather to indicate where tensions may sit, and ultimately to lead to development areas to earn greater trust within the organisation and reap the benefits that that brings. In this question I asked ‘What type of reward is most valuable to you?‘. A previous question indicated that 35% of people feel most valued when they are rewarded, and this question delves further into that. Do we assume that the reward needs to be financial, or can we quantify how significant other types of rewards are? 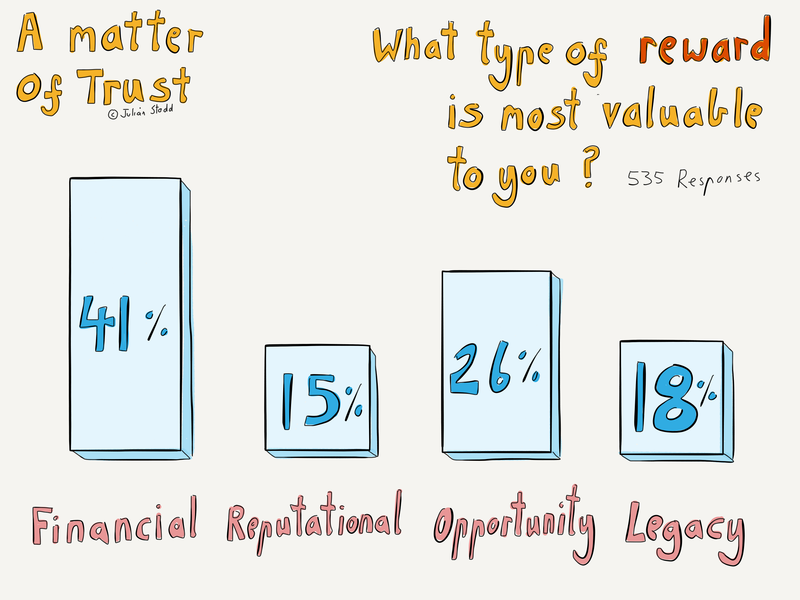 The results were quite clear: 41% of the 535 respondents said that financial reward was the most valuable to them. 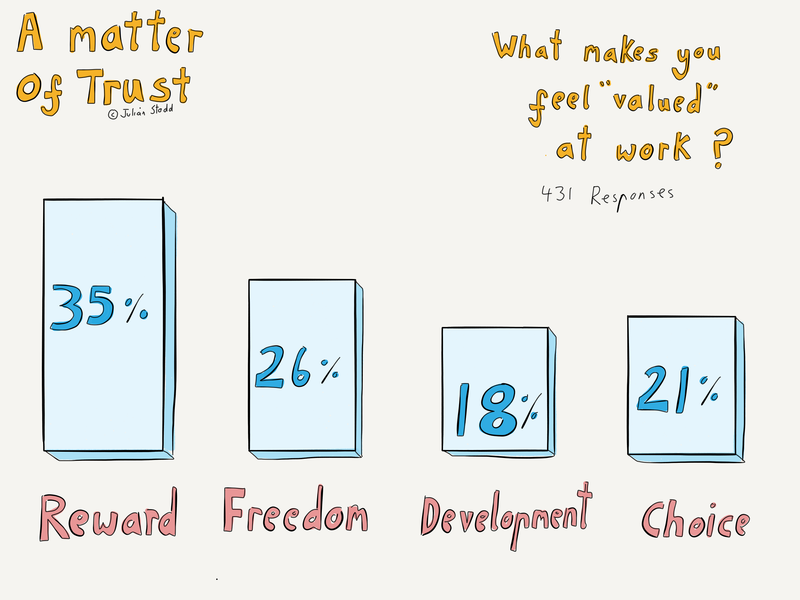 While significant, I think that the other three areas can certainly indicate other actions we can take to make people feel valued and earn trust. 15% valued reputational reward, which sits clearly alongside that which we put at the heart of Social Leadership, and that which is earned within communities. 26% valued opportunity, and 18% legacy. I am tempted to explore further the link between ‘reputational’ reward and ‘legacy’, as I suspect they are closely interrelated. In a previous question we saw that 18% of people feel valued if they are offered development opportunities, and here we see that 26% value opportunity as a type of reward. An early insight may be that some people are highly motivated by development opportunities and reward, but it is a clear subset. This sits nicely alongside the ways we develop Social communities, providing development to community leaders. This type of early-stage research is like shining a light through fog: you see dark shapes swirling around you, but cannot quite pinpoint the location of any of them yet. If I were to draw an early-stage conclusion, it would think that this work is highlighting the nuanced state of the ways we perceive trust, value, and reward. Primarily I’m interested in this work in how it relates to the organisation becoming Socially Dynamic: aligning formal and social aspects, systems, processes, and communities, to become more agile. To develop the Social aspects, we need trust. 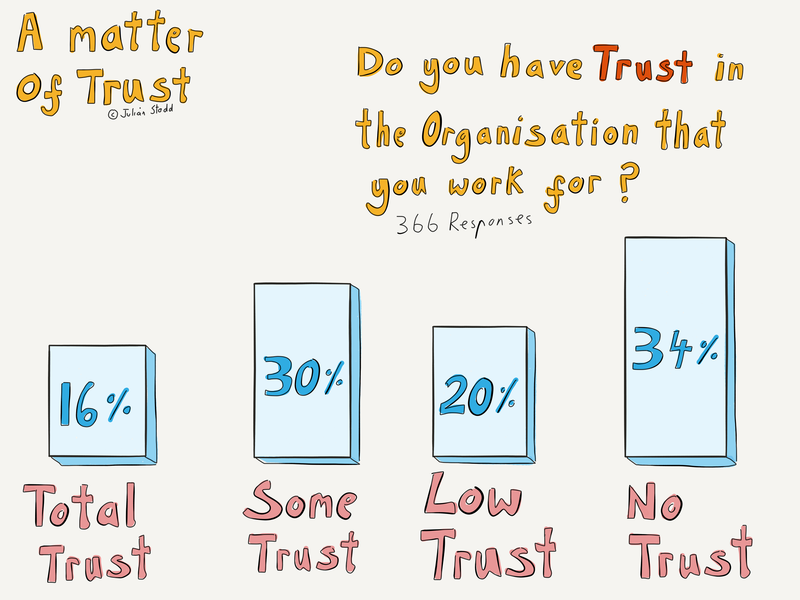 The first question we asked established that 54% of people have low or no trust in the organisation they work for, so we have a clear target, and I would argue that marginal returns in the space may give significant competitive advantages. We know there was a clear correlation between trust and engagement. We also know that systems and processes do not drive trust: an earlier question showed that 54% of people value ‘freedom’, compared to 14% who value ‘predictability’. That speaks strongly to me that many people want to be noticed, want space to explore, experiment, and learn. Much of this work can be related to some of my previous work around culture: that organisational cultures, especially at scale, are complex and multifaceted. Indeed, we could argue, that instead of a single culture, most organisations house multiple, highly coherent sub cultures, often based around different notions of trust and truth. It is the ways that we facilitate dialogue and cohesion between the sub cultures which will allow us to become Socially Dynamic. We are not looking for conformity or uniformity, but rather for glorious difference aligned around shared values and shared purpose. We should celebrate the difference, whilst recognising that it is difference, and that if we don’t understand it, it can fracture the culture of the organisation. This entry was posted in Reward, Trust and tagged HR, Leadership, Legacy, Opportunity, research, Reward, Socially Dynamic Organisation, Trust, Types of Trust. Bookmark the permalink.